When I login, nothing happens. I am presented with my desktop wallpaper. No Dash, no Launcher, nothing. This answer applies versions of Ubuntu running Compiz. This answer assumes Unity is being run through Compiz. If you don't have compiz installed this answer doesn't apply to you. Reboot if it doesn't work right away. Press Ctrl+Alt+T for a terminal and run ccsm, then re-enable your 'Unity' plugin. You also may then need to run a unity --replace. It is a good idea to check your graphics driver is configured to use hardware acceleration and it is configured to use OpenGL. Try searching Ask Ubuntu and Ubuntu Forums for information specific to your GPUs and Ubuntu flavour. For hybrid graphics users see the last section "Hybrid Graphics" below. You might want to run the compizconfig-settings-manager package and make sure that the Unity plugin is checked (see What are some of the issues with CCSM and why would I want to avoid it?). Change to tty1 by pressing Ctrl+Alt+F1 and log in. Press Ctrl+Alt+F7 (or Ctrl+Alt+F8 sometimes) to get back to the graphical display where there should be a CompizConfig Settings Manager screen sitting there. Find the Unity plugin. Enable it. Everything should spring into life but if it doesn't, you might have to restart. You can do that by going back to tty1 and running sudo reboot. It will reset Unity back on TTY 7 (Ctrl+Alt++F7). But that won't work if a windows manager is already running on display 0 (it will give you an error, just use unity --replace in that case). You should then have Gnome 2 style panels on your desktop, which you can use to logout. Some very useful information and further reading for hybrid graphics users can be found here. I would really prefer the stable PPA, but it does not seem to have packages for 13.04 yet. Update: these seem to be available as of Sep. 25. I would install this stable PPA - you can try but I have not tested it. The Ubuntu-supplied Nvidia drivers were already installed and I simply installed from this PPA by adding it and doing a package update using update-manager. UPDATE: As of Oct. 6, ppa:xorg-edgers/ppa seems to contain bumblebee as well. So if you install from this PPA, you might want to try skipping the addition of the Bumblebee PPA and installing it from here instead. and your unity session will come back before your eyes.. This technique is better than re-launching ccsm, because you can get into OP's error condition without even accidentally de-selecting unity in ccsm; you can get it simply by accidentally pressing the "preferences" button in ccsm. I had this problem too. I solved it with deleting the content of the ~/.config/compiz-1/compizconfig file and relog. I have had exactly the same issue. If you have Compiz Config Settings Manager installed it may be that the Unity Desktop Plugin is disabled. Unity Shell will not load in the default desktop if the tickbox is not checked and you will get the session in your picture. Developers are always fixing bugs, so an alternative is to wait, and to follow progress on bug fixing (subscribe to Unity development in Launchpad). Run sudo shutdown -r now in a terminal. At the login screen after your system restarts, choose Unity 2D (for now) by right-clicking the sprocket icon. Wait for a fix for Unity 3D/Ubuntu 11.10 (e.g. a week). Update your system to get the fix; in a terminal type sudo apt-get update && sudo apt-get upgrade. UPDATE: I was able to resolve this by using ccsm, from Unity 2D login. At the login screen, select Unity 2D and login. Install ccsm (CompizConfig Settings Manager) by running in a terminal: sudo apt-get install compizconfig-settings-manager compiz-fusion-plugins-extra. Start ccsm, and select the category Desktop. 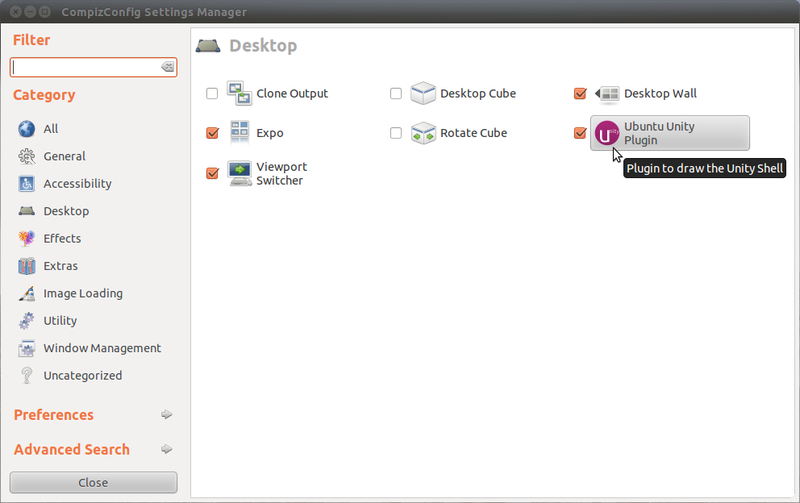 Enable the Ubuntu Unity Plugin; if asked to resolve conflicts, select the MIDDLE button for all conflicts. Close ccsm when done. Restart, select Unity (3D) and login. Install Nvidia drivers from https://edge.launchpad.net/~xorg-edgers/+archive/ppa. I would really prefer the stable PPA at https://edge.launchpad.net/~ubuntu-x-swat/+archive/x-updates, but it does not seem to have packages for 13.04 yet. Update: these seem to be available as of Sep. 25. I would install this stable PPA - you can try but I have not tested it. (stable release for 13.04 too now - not tested by me). This happened to me as well in Ubuntu 16.04 after an upgrade of unity and compiz packages. None of the above worked. The only way I found to have launchers and dashes back was to remove (while NOT logged into Unity) the directory .cache in my home. I just tried this and it works! Remember, always make backups! However, sometimes a fresh install is good, reinstall Ubuntu? It seems there's a problem with 12.04 Unity 3D and the current Nvidia drivers. See this post (Unity 3d no longer works after installing 12.04) for details of how to work round the problem. I have a 32 bit Pentium 4 3.06 GHz Compaq D520SFF, with an Nvidia GeForce 6200, running kernel 3.2.0-24-generic-pae, and had exactly the same problem (2D works, 3D doesn't), and downgrading the Nvidia drivers got 3D working for me in a couple of minutes. For the icons, it is due to Nautilus. Write nautilus & in a terminal, do not close it, and the icons will be back. EDIT 10/10/2013: for Nautilus you can also type Alt + F2 to open Unity command line prompt and write nautilus in the global search/prompt CLI. A file explorer will open. You can close it if you want. unity with 14.04 in combination with IBM Notes9 resulted in some strange behavior (mouse clicks would stop working). My workaround for that was to open a terminal and restart unity by typing unity &. The last time I did that, it totally corrupted unity - the no dash, no launcher no nothing. I think I tried EVERY suggestion that is listed on this page - none of it did help. I installed the unity-tweak-tool; than I ran unity-tweak-tool --reset-unity and rebooted. Afterwards, unity was back alive. Obviously all prior configuration changes to unity were gone, but that is what --reset-unity is about. And the big advantage of this solution: it requires you to only add a single package and to redo your unity config changes - but you do not have to reset compiz, install ccsm, or follow all the other lengthy activities. the other solution I find very helpful nowadays comes from here - the point: sometimes you have to remove (or even better: pull in a "working" backup) of your ~/.config/dconf/user file. I find Unity to be really buggy on 13.04 with my Nvidia card.. YMMV. after you finish, remember to Ctrl+Alt+F1, hit Ctrl+C (will end the new X session), type exit, Enter, will end the terminal (blank screen) session. if you think you missed typing exit, just hit Ctrl+C and type again, don’t do it too fast. Still looking for definitive Ctrl+Alt+F1 proper solution Ubuntu 12.04 + nvidia. helped me to completely resolve these symptoms under 12.04 (64 bit). error while loading shared libraries: libGL.so.1: cannot open shared object file: No such file or directory. This not only allowed both unity_support_test-p and unity --reset to run, it also allowed Unity 2D to start. I have no idea what caused my problems, but since creating the links above (several weeks now) I have had no further problems. When I accidentally upgraded from 12.04 LTS Ubuntu to 13.04, I too had to face the same issues such as missing side menu bar, no window options, not being able to switch between applications (alt-tab) and I couldn't even drag windows on the screen. After following so many options I ended up with the following set of commands to fix these issues. I actually removed aspell because of conflicting dependency. This might not have any correlation between this issue. 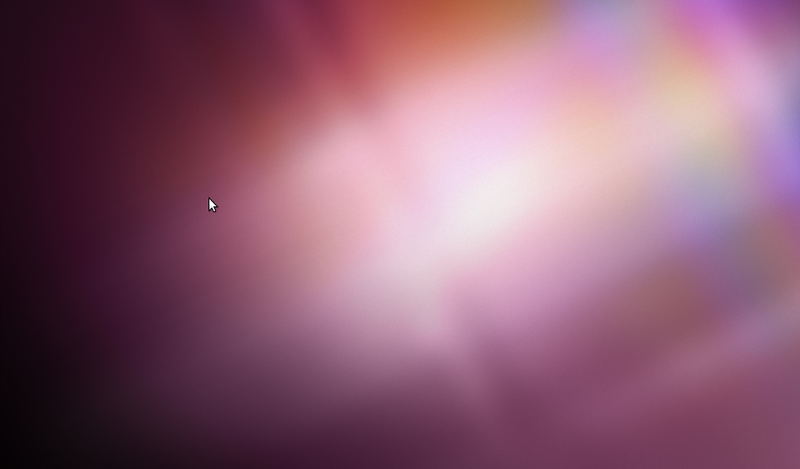 I think re-installing lightdm and resetting compiz helped me in fixing this. It happens when you login with another tty and try, as the same user, to start X (with startx or initx) . For example, Ubuntu runs in tty7. With Ctrl+Alt+F1 tty1 opens. Log in as the same user, and run startx. Go back to tty7, logout and login. You only get the desktop wall paper. To solve the problem, choose tty1, login, remove the .Xauthority file in your home directory, logout, login. Solved. I had the same issue after doing sudo apt-get install kubuntu-desktop which broke my lightdm install for some reason. I'm running 16.04 here. That fixed it for me after hours of pulling my hair out. I reset compizconfig by removing its cache (actually the command makes backup, so it can be restored). Attention: This removes your custom Unity setup. I am having the same issue, and solved by following using pycharm's terminal. Apparently, unplugging my second monitor was the fix, and then I was able to install and update the correct drivers. Today I've encountered situation where user of my script has decided to launch it by placing the call to script into his $HOME/.profile file. As a result , Unity couldn't launch. Scripts by nature are sequential, so .profile basically was waiting for the script to finish , and Unity couldn't start if .profile didn't finish running. I've done the same thing,called the script from .profile, and received the same result - my login screen wallpaper stayed there, no dash or launcher appeared, could not right click on desktop or perform any action other than login to TTY1. The solution was to remove appropriate line from the .profile. It's possible to detach a command from .profile using the ampersand, <command> & form , but the problem is that every time user opens terminal or logs in to TTY, a new instance of that command is spawned. Hence, I would strongly advise not to launch any programs from .profile unless you know what you're doing. My desktop disappeared, how do I get it back?